CSK vs KKR IPL 2019 Live Broadcast: Chennai Super Kings vs Kolkata Knight Riders live Streaming for free in HD quality. The first round of the Indian Premier League 2019 (IPL 2019) has finally completed but it still managed to keep us hooked to television or online IPL live streaming mobile applications such as Hotstar. Except Sunrisers Hyderabad, all teams have played more than seven matches and they do not leave any stone unturned to keep themselves in the top four positions in IPL 2019 point table. It is to be noted that the teams who managed to keep themselves in the top will qualify for the playoffs. Before diving more details about live telecast, Start time, venue, updated time table and live score of today’s match, let’s take a look at Kings XI Punjab (KXIP) vs Royal Challengers Bangalore (RCB) highlights. Finally, RCB has registered its victory in Vivo IPL 2019. Kings XI Punjab scored 173 runs, but it was easily chased down by Virat Kohli-led RCB. Due to Kohli and AB De Villier’s outstanding performance they won the match by eight wickets. Mahendra Singh Dhoni-led Chennai Super Kings will continue to rule the IPL 2019 points table as they played seven IPL matches and won six and have a good net run rate as well. 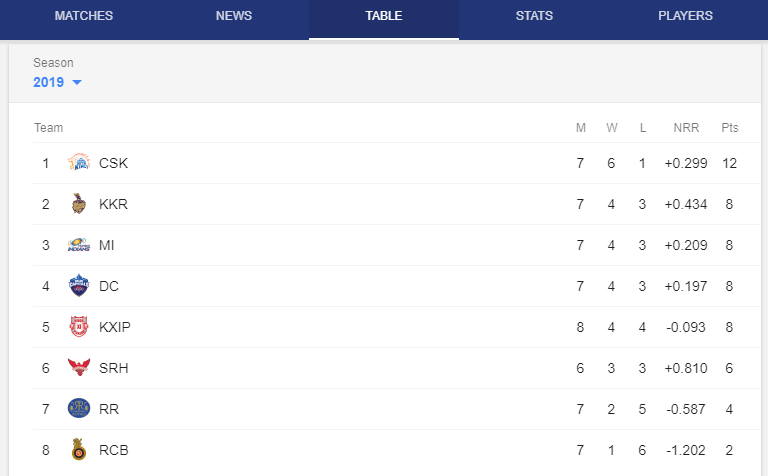 Currently, KKR has 8 points in their kitty, followed by Mumbai Indian (MI) and Delhi Capitals (DC) in the IPL 2019 points table. Chennai Super Kings to lock horns Kolkata Knight Riders in the IPL 2019 match 29. The match KKR vs CSK will be played at Kolkata’s home ground Eden Garden. The CSK vs KKR is scheduled to begin at 4:00 p.m (IST). The cricket lovers can watch the live telecast of IPL match on TV and via online streaming. Star Sports holds the telecast rights of IPL 2019 and will telecast the match live across its network. The live streaming online of IPL 2019 will be available on Hotstar app and website.